Backyard Gardening: Is It For You? 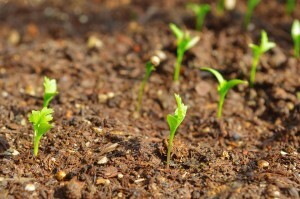 Soon after planting, seeds will pop through the earth. The growing popularity of backyard gardening has been consistent for several years. You’ve come to that time of year when you consider it… again. Let’s look at this idea from a journalist’s point of view and answer questions from the 5 W’s and 1 H: Who, What, Where, When, Why, and How. The first answer may be obvious: You. Gardening can be as simple as one tomato plant in a container on your back patio. You choose the best looking plant and get all the supplies, plant the tender vegetable and begin to dream of luscious tasting additions to your salads this summer. Then again, you consider your vacation, time running the kids back and forth to their activities, that extra time you build in for the unexpected things that always seem to come up, a couple of business trips…. Do they grow better started from seeds or from a young, tender plant purchased from your neighborhood nursery? Would you rather have organic and heirloom seeds/plants or does it matter? A lot of companies produce organic seeds and often their catalogs are free. Use google.com to research. What supplies do you need? Do you have any of these now or will you have to buy everything? In addition to buying new, check local thrift stores for gently used bargain tools and supplies. Once you’ve chosen which vegetables to plant, review the following facts. Wichita is in Zone 6a (or 6b, depending on the resource you use), meaning plants need to withstand low temps as low as -10F. The average last spring frost is April 11, with the latest on record being May 13. The last spring hard freeze is March 29, with the latest being May 4. Stay tuned to the local weather reports to know whether to protect your tender plants or if they will be ok during nighttime temperatures. Plants can grow in five-gallon containers, water troughs as well as traditional garden beds. Does your backyard get enough sun? Will hoses reach your gardens? Does your neighborhood have covenants that prevent using containers? Garden beds? Check your HOA rules first before investing in materials and plans. Do you want to grow a garden because it’s the trending thing to do? Check your reality to make sure you have time to plan, plant, and harvest. If you cannot get the thought of a tasty, garden fresh tomato out of your mind, then start small this year and write a journal of your experiences. Set a goal next year to grow your garden space. If you want to tackle the plans and buy all the materials, great for you! If you’d rather someone else handle all the details, check with the Better Business Bureau or yelp.com to find a trustworthy landscaping or gardening business. Their Rapid Response Center assists individuals with issues ranging from insect identification, to disease diagnostics of trees, plants, flowers and lawns to advice on water-wise landscaping. They also have an on-site Learning Center that is free to visit. Have a question whose answer you cannot find online? Call their hotline at 316-660-0190, March through October. All of this information might raise more questions than give answers, but gardening can be a lot of fun and very worthwhile. Family members of all ages can be involved. What will your gardens grow this year?